Attach the rear side hook of the front passenger airbag to the rear side airbag door. Bend the front side hook so that it attaches to the front side airbag door. Install the instrument panel upper (see page ip-9). Install the 2 bolts to the reinforcement. 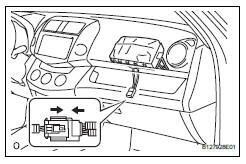 Connect the connector to the airbag. Attach the wire harness clamp to the bracket.